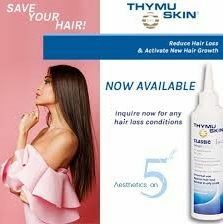 For more than 30 years, Thymuskin has been successfully used to reinforce hair and to improve scalp coverage. The dermatologic system is suitable for both men and women, and is well tolerated, and suitable for long term use. The biologically active GKL-02 ingredient complex of peptides and proteins strengthen hair roots and infuses vital nutrients into the hair and the hair follicles. This way Thymuskin reinforces hair, providing noticeable thicker hair and improved scalp coverage. Scientifically developed, it improves the appearance of fine and thinning hair. Thymuskin products are all preparations which complement each other in their action for the health and vitality of the hair and scalp. The GKL-02 complex of peptides and proteins combined with vitamins A, B, E and F normalize the hair condition and provide important vital nutrients for the scalp and hair. There are three ranges for different categories of hair loss: The classic range, is for severe hair loss, disable thinning and suitable for sensitive scalps and hair. The Med range is great for universal use against hair loss and suitable for mild cases. And the Forte range is for severe hair loss and for a stressed scalp and hair.